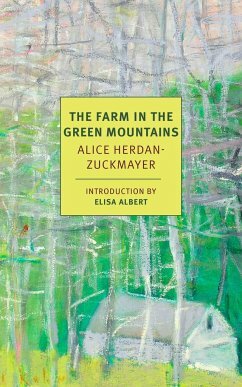 Übersetzung: Washington, Ida H.; Washington, Carol E.
The Farm in the Green Mountains is a story of a refugee family finding its true home-thousands of miles from its homeland. Alice and Carl Zuckmayer lived at the center of Weimar era Berlin. She was a former actor turned medical student, he was a playwright, and their circle of friends included Stefan Zweig, Alma Mahler, and Bertolt Brecht. But then the Nazis took over and Carl's most recent success, a play satirizing German militarism, impressed them in all the wrong ways. The couple and their two daughters were forced to flee, first to Austria, then to Switzerland, and finally to the United States. Los Angeles didn't suit them, neither did New York, but a chance stroll in the Vermont woods led them to Backwoods Farm and the eighteenth-century farmhouse where they would spend the next five years. In Europe, the Zuckmayers were accustomed to servants; in Vermont, they found themselves building chicken coops, refereeing fights between fractious ducks, and caring for temperamental water pipes "like babies." But in spite of the endless work and the brutal, depressing winters, Alice found that in America she had at last discovered her "native land." This generous, surprising, and witty memoir, a best seller in postwar Germany, has all the charm of an unlikely romantic comedy. Alice Herdan-Zuckmayer (1901-1991) was born Alice Henriette Alberta Herdan-Harris von Valbonne und Belmont in Vienna shortly after her parents' divorce. As a girl, she was a pupil of the radical education reformist Eugenie Schwarzwald and Alice met her first husband, the psychologist and future anti-Nazi leader Karl Frank, through Schwarzwald. Her marriage to Frank was short lived and Alice, now living in Berlin with their daughter Michaela, supported herself by acting and with secretarial work, though she hoped to become a doctor. She met the writer Carl Zuckmayer at a party of actors and artists, and the two married in 1925, the same year Zuckmayer was awarded the Kleist Prize for his play The Merry Vineyard. The next year she gave birth to a second daughter, Maria Winnetou. By 1933 Zuckmayer's works had been banned and the family moved, first to Austria, and then, in 1938, to Switzerland. They emigrated to the United States with the help of the journalist Dorothy Thompson in 1939. After the success of The Farm in the Green Mountains, Herdan-Zuckmayer published two more memoirs, Das Kästchen (The Box), about her childhood, and Das Scheusal (The Monster), about a dog. Elisa Albert is the author of the novels After Birth and The Book of Dahlia; a short-story collection, How This Night is Different; and the editor of the anthology Freud's Blind Spot. Her fiction and nonfiction have appeared in various publications, including The New York Times, Tin House, The Guardian, and on NPR. Ida H. Washington taught German literature for many years and, along with her husband, Larry Washington, helped found the German-language program at the University of Massachusetts at Dartmouth. She is the author of Dorothy Canfield Fisher: A Biography and collaborated with her daughter Carol E. Washington on the translation of The Farm in the Green Mountains.